No Telling – Southern culture, writing prompts, typewriters, and tornadoes. Bless your heart. 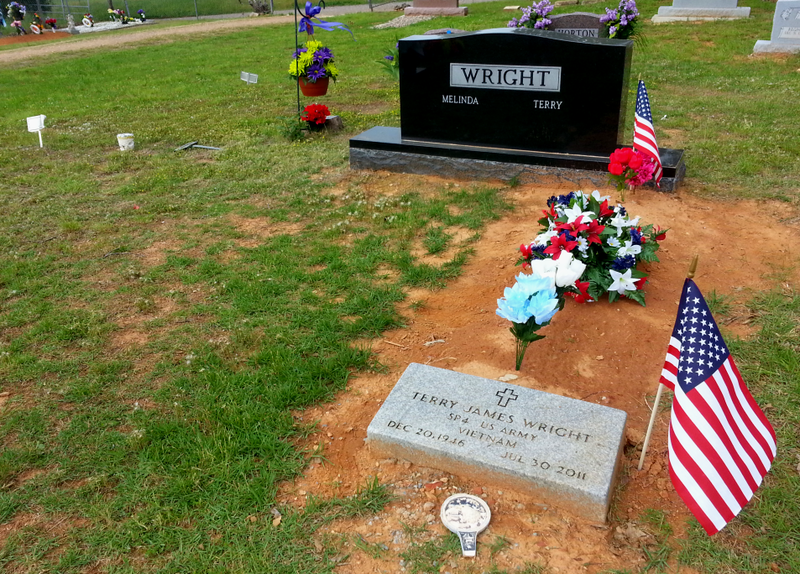 Out in the counties, Decoration Day is a pre-Memorial Day sacrament. 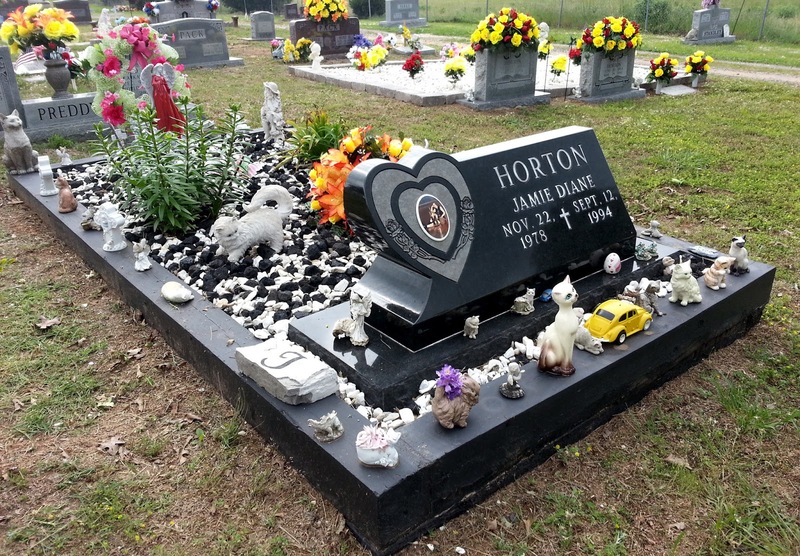 Families drive in from all over to tidy-up plots, to place flowers both real and otherwise, and to remember. 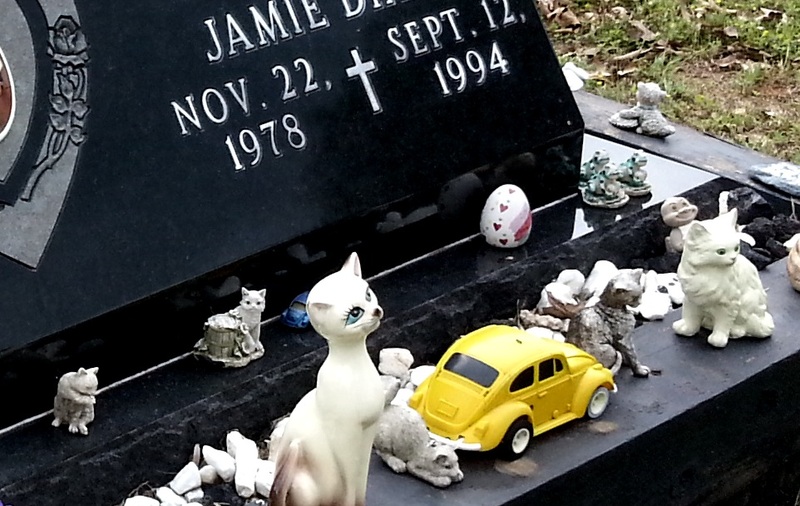 On Saturday, I rode with my friend Melinda to Canaan Cemetery in Marshall, Arkansas for “Decoration.” Kids running through rows of headstones, old women teetering under enormous floral sprays, young mothers manicuring grass with garden shears. Busy, somber, reflective. I’ve lived in the South all my life and this was the first Decoration I’ve ever seen. No one in my family is comfortable with grief, I suspect. We have always avoided sadness and the places that remind us of it. I think we’ve missed out on an important part of the cycle, though. There is a healing that comes from housekeeping a grave. There is also the idea of communal permission to accept – however tragic or timely – that we die. For folks in Marshall, Canaan is the hard evidence of who they are. Men walked the stone rows swapping stories and connections because Canaan is their ancestral record. The oral tradition of Decoration was around long before the internet let us find history in a couple of clicks. Here, a woman can touch the weathered letters of her great-great grandmother’s name and count the tiny stones around it to connect to her maternal losses. We stayed long enough for an unanticipated light rain that reminded me of the day Melinda buried her husband. Although it was scorching Arkansas August, the wind blew suddenly cool at Canaan that day and carried the stark notes of Taps into the hills. There are two hundred years of open arms in that place. A gesture like that is bound to create its own weather. I have passed from brilliant plotting to mostly incoherent stream-of-consciousness, and landed here where it now appears I’m writing a semi-articulate prose poem. Welcome to my NaNoWriMo novel, Day Two. This always happens. My brain is hardwired for poems and I force it unwillingly to tell a whole story. It’s becoming obvious this is a right-brain left-brain thing for me and all I need to do is imagine a clear filament connecting the two on which all the letters dance across and line up in an obedient Times New Roman kind of lockstep. I anticipated this moment (and the twenty or so other ones yet to come) by making myself Think About What Happens Next. Tonight I have these strange camera shots that sound like whale song. I like them, though. Okay. Back to the page. Remember when you were in your early twenties and all the world was an unrealized epiphany? Every day filled with fascination, raw understanding, the daily freshness of discovery and insight? Other than the obvious developmental reasons for this, you were able to see the world as unending possibility because you had time to think about it. If you’re still in your early twenties, then bless your heart. Those are some good years. It’s not as easy to be reflective and creative when you’ve got eleventy-seven things to do after nine hours in a cubicle or whatever. And all those people you’re responsible for – where did they come from? 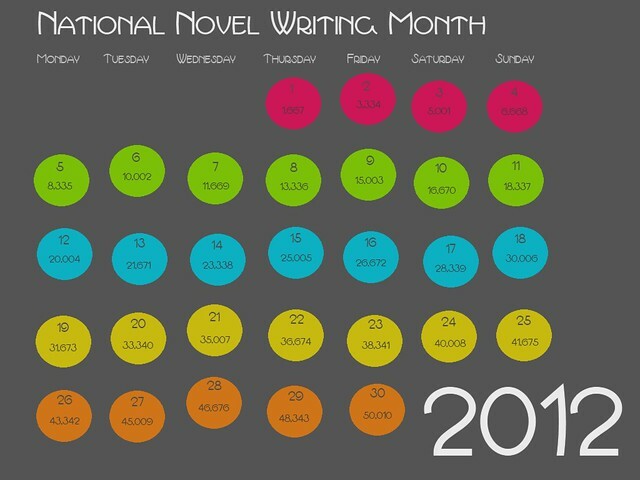 Now you want to write a novel in a month. We need time. A little silence wouldn’t hurt, either. Stop laughing. There is time, I promise. All you need is an hour. The ebb and flow of your daily madness may dictate which particular hour, but if you’re like me you have to steal it from something else. I steal mine from 5:00-6:00 am. This works for me because The Perfect Grandson is asleep and all my synapses are firing up. The bonus here is that I leave for school full of self-congratulatory mojo for having written my 1,700-ish words already. Instead of walking around with guilt all day, I can let my story percolate and the rest of my life gets done. Maybe your Magic Hour is late at night. Maybe you have to break up your hour into two Magic Half-Hours. It doesn’t matter, really, as long as you’re realistic about it. Just keep in mind that the first few days are slower than the rest and give yourself permission to miss the word count a bit until the story really takes off. Luckily, NaNoWriMo begins on a Thursday this year and you’ll have a weekend handy to get into the rhythm. What if you manage to find extra time? Wow. Use it to hedge yourself against the unexpected, because at least one unforseen time-gobbling event always happens at some point during the month. Anticipate trouble. Embrace your bad luck now and write an few hundred extra words here and there. Simplify everything. Use this weekend to cook massive amounts of freezable food. Stock up at the grocery store and vote early. Train your family to do some things for themselves and vow to live happily with the results until December 1st. Plan to stay away from Ebay, Facebook, Pinterest, or whatever vile online thing distracts you. Think Lent. In December, we can all take toast and tea. 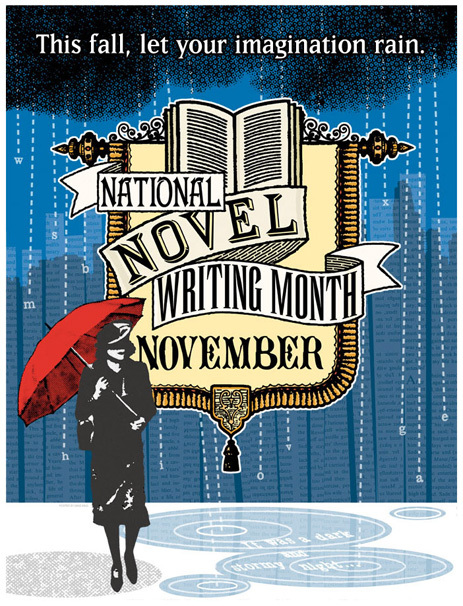 This year’s National Novel Writing Month will be my fourth rodeo. I’ve written and helped others to write for awhile now and so I thought I’d sling a little advice out there to help writers who are taking the plunge. Still haven’t decided whether or not to participate? Aw, go ahead. The worst that can happen is that you don’t finish. At best you’ll find yourself suddenly in December with a novel. Your novel. The realistic commitment for November is to give yourself an hour a day. 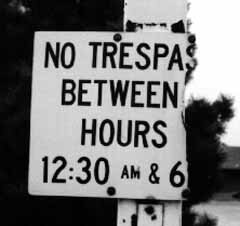 If you’re a cracker-jack typist and don’t look at your fingers, maybe 45 minutes. So how much time do you spend on Facebook watching kitten videos or reading what your friends ate for lunch? Seriously, write a novel instead. No idea where to begin? Start with a character. They’re everywhere you look. When I was a little girl there was this crazy old woman who dressed up in her Sunday finest and pedaled a rusty Schwinn all over town. She had penciled-in eyebrows up to her hairline and failed to wear underwear occasionally, but she always sported a fine pillbox hat. I haven’t written her yet, but I will. It’s likely you have characters like this floating around in your memory or pedaling past your house. Build your story around the unanswered questions. Keep Planning Simple. I’ve seen folks compose elaborate, tabbed notebooks of plot twists, character biographies, geographical maps, and chapter outlines. Bless their hearts. If this sort of thing works for you, by all means use it to some extent. But beware, because I’ve also watched more than a few writers quit altogether the first time their fully-planned characters decided to change direction/motivation/gender/the whole plot, and your characters WILL DO THIS. If you’re planning begins to look like a quadratic equation (whatever that is) or takes more word count than actually writing the novel, it’s time to step away from the computer. It’s possible to plan yourself into a corner and no one wants that for you. Remember, writing a novel isn’t about control as much as it is about possibility. Think in Scenes. Before the first day of November, make a list of scenes. Don’t call them chapters because they probably aren’t. Open up Word (or whatever you’re using) set up a folder for each scene. Label each with a word or phrase like “They Find the Body” or “She Realizes He’s Cheating.” Why? It’s about frustration and choice – always leave a key under the mat so you don’t get locked out. If you find yourself suddenly stumped or blank or worse while writing one scene, CLICKETY-CLICK and you’re in another. At the end of your daily writing jag, copy and paste what you’ve written into a Whole Enchilada folder to get your running word count. Save it everywhere. Twice. Keep adding these scene folders throughout the month. Once you’re writing every day and walking around with the story, new scenes will start popping up all the time. Ultimately you won’t use or need every single one and that’s just fine. Just don’t delete any scene folders, even the ones with only a paragraph or a curse word. Ever. You’ll thank me later when you decide to dive into revision. What? You mean write the story out of my carefully crafted order? Absolutely. Here’s the thing: you’re going to do it anyway so plan for the inevitable. Give yourself permission from Day One to alter or abandon course. It’s your novel – you can do whatever you want. That’s why it’s fun. That’s why we do it. I had an English professor in college who was famous for his shabby ride. It was some flavor of mid-60s rusty Chevrolet, clearly blue and white at some point, but its beauty was long faded. We all thought it added to his understated poet-coolness and figured he drove the nasty thing simply for effect. I know now that we were wrong. Listened to this ditty on NPR about the death of the CD and I had a little moment. So the CD is out? What? As I reached over to turn up the volume it hit me. I still drive a car outfitted with a swanky cassette tape player. The ’02 Avalon has 47,000 miles (and change), so it looks like I’ll be listening to cassettes a little bit longer. The old girl should be able to log upward from 150,000 miles before she cries uncle. 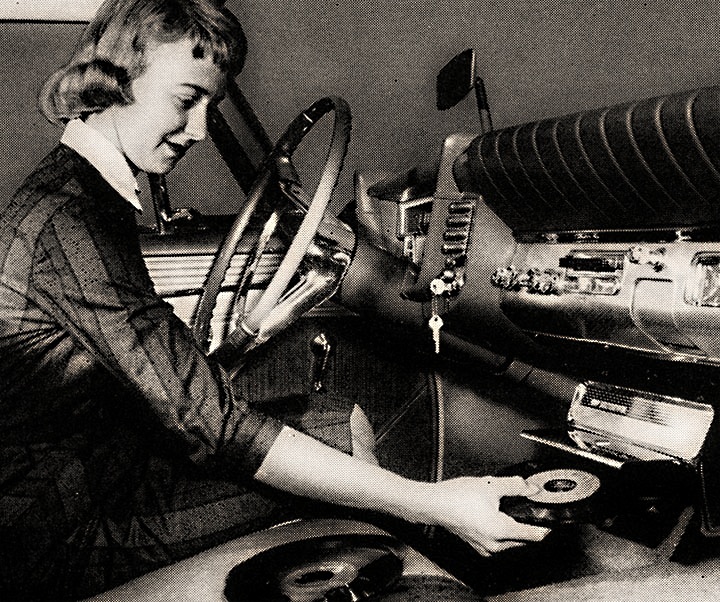 I’m not buying a new ride over archaic music technology. In fact, I’m not buying much music at all if they keep up this bait-and-switch business. I still know how to load up reel-to-reel and I can spin one record while seamlessly queuing up the next. Neither of these skills come in handy while using an iPod, but I don’t have one so it doesn’t matter. And yes, I know how curmudgeony that sounds. It’s all clear to me now. I’m fast becoming Professor Chevrolet. I won’t even hazard a guess how this has happened, because I’m all too familiar with suddenly looking up and finding myself in another decade. The important thing is now I understand this man’s motivation. It’s not about cool, it’s about paid-for. As long as the radio works, I’m golden. 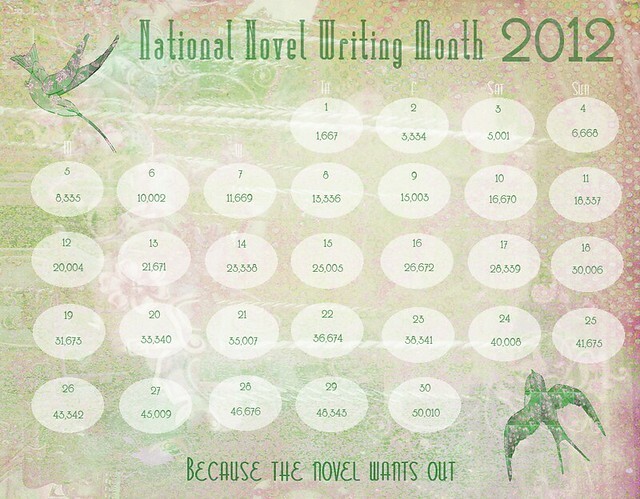 In anticipation of National Novel Writing Month, and because I adore you all, free NaNoWriMo Calendar wallpapers all round. these come in handy to help log the word count. Whipped these up myself, so feel free to click on the picture and download away. My gift to you. If you’re in the mood for something with more vintage oomph, cruise on over to Fresh Ribbon where I’ve left a little something extra. 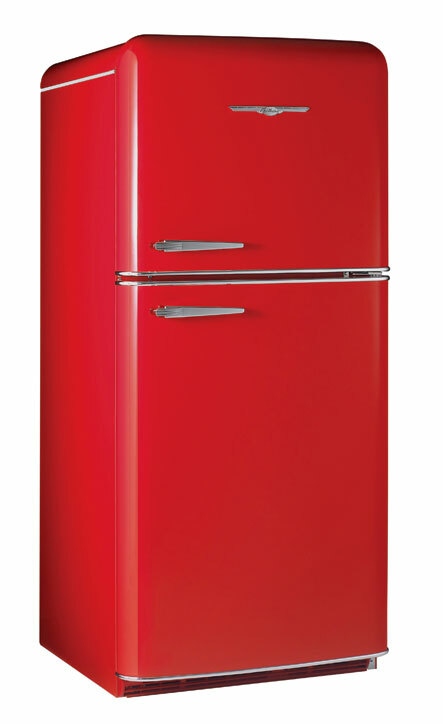 There are more colors, by the way, and you’re just a click or two from choosing. We made a smooth mess. Always do. Six women, a mountain of yarn, dyes to die for, and a rainy Saturday. We have enough now to knit a sweater for Saturn and mittens for all its moons. The only thing missing now is winter. For anyone interested, the secret is simple. Add yellow. Before the dyeing and the Pinterest brunch, we made an offhand discovery. 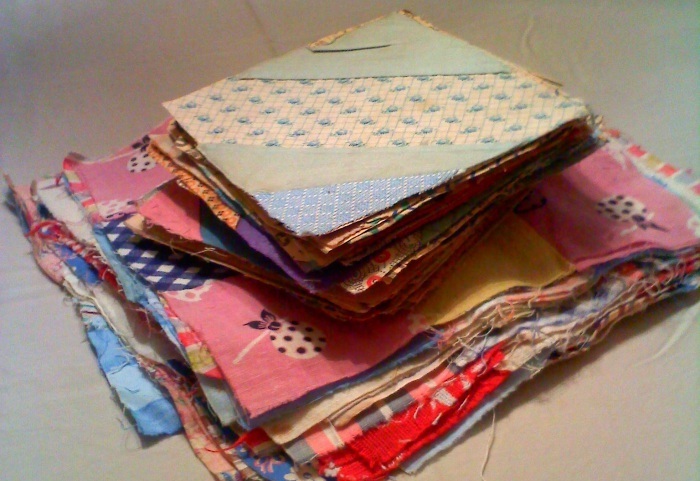 Our hostess had a pile of ancient quilt squares stacked up like an undiscovered treasure. Each hand-sewn block was tacked to old newspapers and ironed into submission. The woman who worked the needle on these pieces meant business and I’m sorry I never met her. I suspect that soon we will spread out these jewels and try to reconstruct this sweet woman’s creative intent. The quilts pieces are one story. 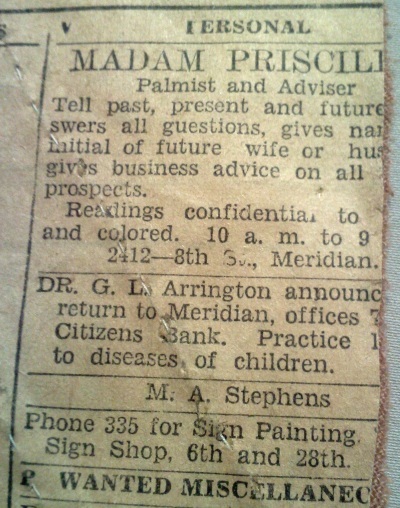 The other is on the newspaper backing dated between August and November 1928 from a New Orleans newspaper. We now know how much to pay for a fresh Sunday dress, the cost of a reasonable boy’s overcoat, and where to go for perfect ringlets and waves. We also know about Madam Priscilla, but not nearly enough. The important thing is this: When you gather half a dozen women on a rainy afternoon and feed inspiration with cinnamon, we can conjure up more than gossip. We can spin straw into gold. Hear that tick-tick-ticking? I do too. It means that in a little over a month the starting gun goes off and we’re galloping willy-nilly toward some ridiculous 50,000 word writing goal. Preposterous. Crazy. And I’m still going to do it. This won’t be my first rodeo. 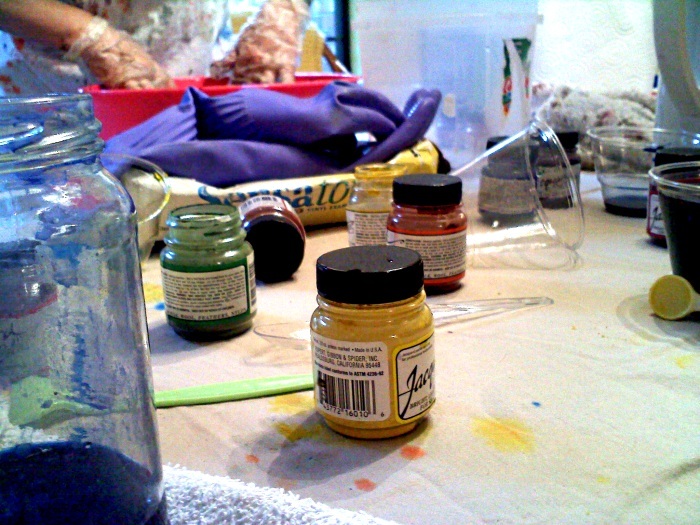 In fact, it will be my third and I know in my tired bones the insanity inherent in taking on such a project. I don’t care. There’s no feeling like slamming out those words every single day, and no feeling like finally limping inarticulate and finger-bone aching to the 50K finish. A novel. Done. There it is. You stumble out of your house into the world and tell perfect strangers in the WalMart checkout line. You tell your friends, even the ones who don’t write, and even though you realize most of them don’t give a tinker’s damn, you whisper hoarsely…fifty-thousand words. The friends who love you will give you carb-filled goodies and say bless your heart. And you nibble and smile and say yes, yes bless me. But it’s not about the carbs or the blank stares at the WalMart checkout. This is about the kind of winning that tattoos itself on your DNA. No matter what else happens – if you are, God forbod, run flat by a Cotton Belt freight train – you finished a novel. It might be a first-draft messy bed, but it’s unmistakeably there. Join me. I know there are a thousand reasons not to, but do it anyway. November will come and go and on December 1st you will either have a completed novel or you won’t. We all have stories that need telling, and yours could finally be told. Imagine looking at a stack of printed paper that is all you, all story, and imagine that finally and for once you did it. Now go sign up at the National Novel Writing Month website and look for me. We’ll talk about planning and not planning another time – I have SCADS of handy advice that can make this the best month of your life. Seriously. You can do this. We can do this. Had a marvelous getaway this summer – shopping, knitting, scribbling, eating, ghost touring – up in the Ozark Mountains where a Very Big Outstreched Jesus looks unsmiling on all of Eureka Springs, Arkansas. He turns most of his stern gaze across the mountain toward the Crescent Hotel. After what I discovered, he probably should. The Crescent Hotel was built in 1886 and spent its first fifteen years as a year-round hotspot for the ridiculously rich. To the hounds, and all that. It appears the rich nouveaued elsewhere after a while and owners needed to keep the place running for the eight or nine months their clientele were otherwise entertained. In 1908 the Crescent Hotel opened the Crescent College and Conservatory for Young Women that catered to wealthy men’s daughters and kept the place financially afloat. 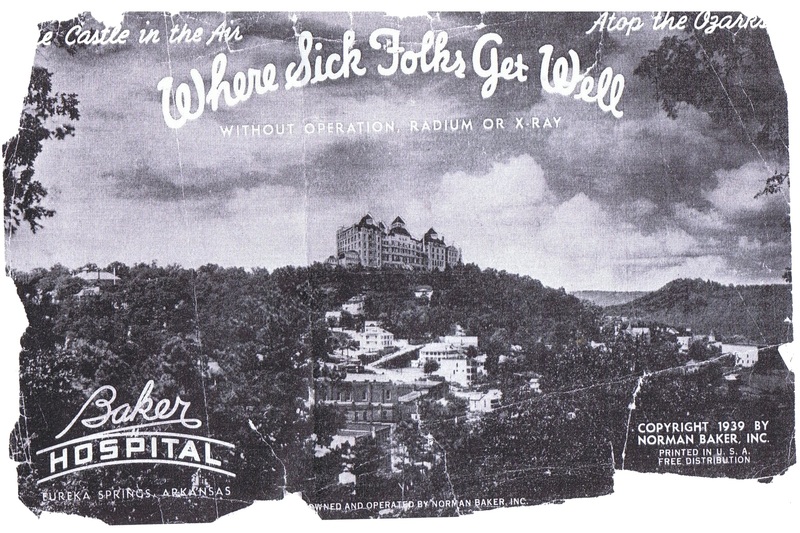 In 1937, a charlatan and failed magician named Norman Baker bought the hotel after he was run out of Iowa on a rail for practicing medicine without a license. He immediately turned the Crescent into a homeopathic cancer hospital and pulled in over 500k a year watching people die while he gave them his own special watermelon seed and carbolic acid elixir. By 1940, he was convicted of mail fraud and spent his final days in Leavenworth dying of cancer. Karma. The Crescent Hotel is famous for its ghosts, and there are plenty. A lusty stone mason named Michael tends to be inappropriate with women who stay in room 218. Theodora is a cancer patient who regularly moves in and out of room 419, although she sometimes forgets her key. A nurse rattles a gurney down the second floor hall at all times of night. 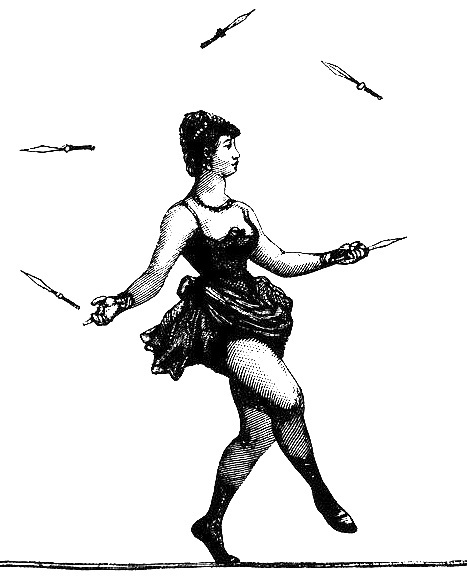 Dancer Irene Castle twirls around here and there as a celebrity spirit. Even Dr. Baker himself has been seen roaming the basement that was once his autopsy room. The one I’m most interested in is an unnamed Woman in White, a student of the Conservatory for Women who either threw herself or was pushed from the third floor balcony. She was “with child” and rumored to be in love with a local boy. Although I didn’t see her, it’s said she often tends to float upward from the place she fell. And I have plenty. While I find the good doctor’s story intriguing, tales of chicanery and confidence men in Arkansas are fairly commonplace. The handsy stone mason ghost is more of an anecdotal punchline. For true story power, it’s the Conservatory for Women and that young thing tumbling over the balcony. A nine-month finishing school for wealthy young women. What rich man sends his precious daughter in the best marriageable years of her life to such a remote location? I didn’t buy this initially, and for a day or so assumed these were Working Girls housed at the Crescent Hotel for the convenience of wealthy male visitors. It’s still a possibility. One of the few pictures of the girls at the Conservatory. They’re bowling. If the Conservatory was truly the school it purported to be, there should be attendance records, and those easy enough to research. It’s the “why” that’s compelling. Were these girls troublesome enough at home to require shipping off? Or were they In Trouble, and the Crescent Hotel a lying-in hospital for unwed mothers? The historical and physical juxtaposition of St. Elizabeth’s Church, with it’s odd bell tower entry yards from the hotel’s front door is curious. The sisters of St. Elizabeth’s operated a small hospital and girls’ school at the same time, although probably for a less moneyed clientele. Was there an orphanage? Makes me wonder. So do the stories about laundry being lowered up and down via pullies and a large basket. And there’s that Woman in White plunging over the third floor railing. 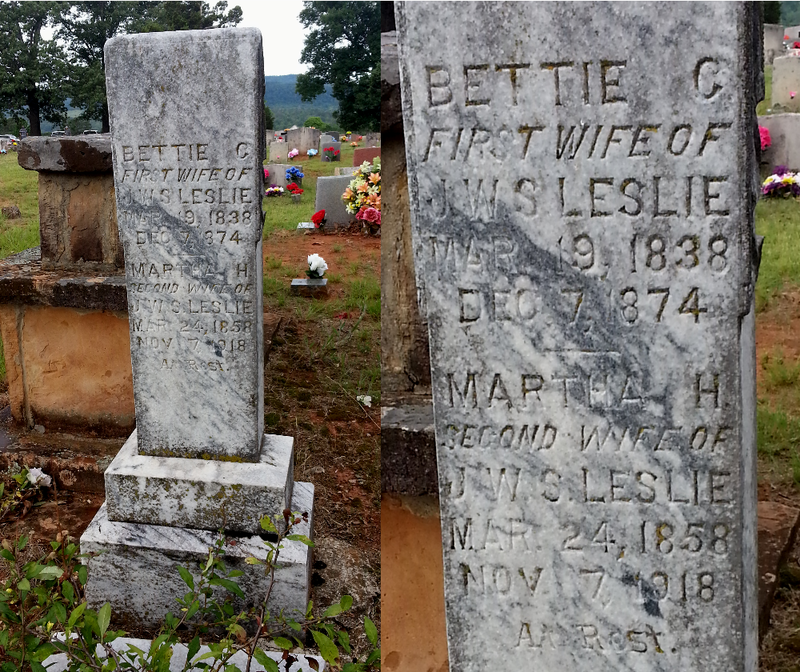 Bottom line, at the turn of the last century wealthy girls in their late teens and early twenties were busy making their debuts and finding husbands, they were not lingering most of a year far away from home in the Arkansas Ozarks. There were reasons girls were sent away like that, and none of them were flattering. And the Very Big Jesus? No connection. It turns out the 65 1/2 foot statue was the centerpiece of a late-60s religious themepark that never quite materialized. God I love Arkansas. Links to videos from visitors, including my favorite series featuring some charming kids who do a great job narrating their investigation. In addition, a few ghostly photos taken by hotel guests and visitors. Yes, I’m aware that there is a deadly hurricane blowing up New Orleans’ skirts right now. And I’d have to be in a coma not to know about the Republican National Convention bellowing even as I write this. I’ll attend to these things later. Right now The Perfect Grandson is covered stem to stern in seed tick bites. That is the immediate situation here behind the suburban brick wall, and it’s got me worried sick. Bear with me here. It took an hour and a half for his mama to remove seed ticks with a pair of steady tweezers. Hundreds of them, tiny, and most on Very Delicate Places. A five year-old boy (or any boy, really) should NEVER have to endure such pain or close inspection. I don’t have to explain the whole Rocky Mountain Spotted Fever/Lyme Disease/Tularemia paranoia to most of you, because I’m fairly certain you thought about it two paragraphs up. 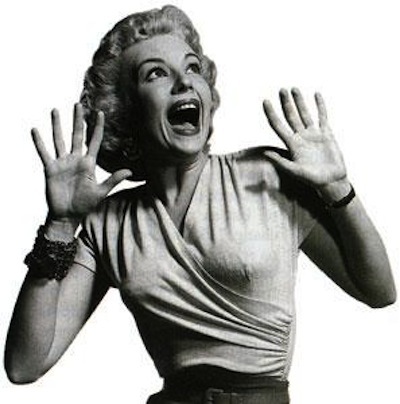 So far, no big fever, no scary joint pain – nothing to make me go into full blown Mimi-panic. He’s got two pairs of worried woman-eyes staring him down, so there’s not much we’ll miss. How did he get into all these ticks? Ask his grandfather. Same guy who visited his son at Children’s hospital some 25 years ago because that little five year-old boy had Tick Fever. I’ve written on this blog for five years without bringing up anything about the man, good or bad, and it was on purpose. I’m breaking that vow of silence right now. When you’re given insect repellant, use it. This is Arkansas in August and you are a grown man who should know better. Take care of the boy when you’re given the gift of his company, or I will fly at you like a witch unhinged. Just like I used to. Sorry about that, folks. I’ll let you get back to your hurricane watch and that Republican soiree.